IT was reported that on Dec 30 the Pakatan Rakyat-led Perak government gave out 11 freehold land titles to residents of Kuala Rui new village in Grik. The 11 are said to be the first batch of 47,000 lot owners in 134 new villages and 102,000 lot owners in 349 planned villages in Perak who are allowed to convert their land titles from leasehold to freehold. State senior executive councillor Datuk Ngeh Koo Ham reportedly said: "I strongly believe that whatever we do is legal. We have gone through vetting by at least 10 senior lawyers, including a former Court of Appeal judge. "With due respect to Deputy Prime Minister Datuk Seri Najib Razak, he has erred in his legal opinion as to the right of the state to give freehold titles." Ngeh was responding to Najib's statement made after chairing the National Land Council meeting on Dec 23 that the Perak government must first obtain the approval of the council before converting leasehold to freehold titles to ensure uniformity in procedures and policies. Meanwhile, Penang Chief Minister Lim Guan Eng threatened to take the Federal Government to court if the land title conversion issue was not resolved with the council. Lim added that the council could only "advise and consult" the state government but could not make any decision on its own. "As such, the state government has the final say in granting the freehold status without going through the council," argued Lim. Like their decisions to waive all summonses for illegal hawking and traffic offences in Penang and Perak, affording this automatic right to convert from leasehold to freehold is another populist move of these two state governments. 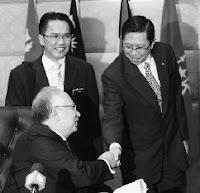 This sentiment is best reflected in the words of former MCA secretary-general and minister of housing and local government Tan Sri Ting Chew Peh who was quoted by a Chinese newspaper as saying: "Upon hearing the good news, my townsmen, relatives and friends applauded till their hands hurt! One who wins the hearts of the people wins the world. Pakatan Rakyat has brought the house down this time." There is no doubt that this popular move will bring about a windfall to the affected landowners, probably doubling if not tripling the value of their properties after the conversion. The move will also reap huge political gains for the two Pakatan-led state governments. This is understandable because unlike a leasehold title which reverts to the state when the lease period expires, a holder of a freehold title holds his property as good as in perpetuity. The freehold title owner will only lose his land if it is subsequently forfeited by the state because the landowner either fails to pay the quit rent or acts in breach of any condition expressed in the title. Other than this, if later the state wants the land back, it has to compulsorily acquire it by paying compensation to the landowner under the Land Acquisition Act 1960. However, this move has also raised some interesting legal issues. Firstly, this conversion process has to be initiated by the landowner applying to surrender the entire land to the state authority. The procedures are set out in sections 195 to 199 of the National Land Code 1965. - consent in writing has been obtained from persons who have an interest or claim over the land such as a chargee, lienholder, lessee, tenant and a caveator, if any. Once approved, the land is re-vested in the state authority as state land. The state authority will then alienate the land as freehold to the landowner under section 76 of the code. While the process appears to be simple, it can actually turn out to be an administrative nightmare as once the new freehold title is issued, the aforesaid persons will have to act fast to protect their interests. Only one type of land cannot be alienated as freehold, that is, land which forms part of the foreshore or seabed. Of course, if the freehold titles of the alienated lands are not issued by the next general election, it is only natural that the affected landowners will have to continue voting for Pakatan Rakyat for fear of losing their land. This is because section 78(3) of the code provides very clearly that alienation is only complete upon the registration of a register document of title notwithstanding that the alienation has been approved by the state authority in which case the land shall remain state land until that time. - the state authority is satisfied that there are special circumstances which render it appropriate to do so. Hence, both the Penang and Perak governments are relying on the third ground, namely "special circumstances". Unfortunately, there is no definition of the phrase "special circumstances" in the code, but it is clear that it is the state authority, which is essentially the state executive council, which will decide what are these "special circumstances which render it appropriate to do so". "Special circumstances, as the phrase implies, must be special under the circumstances as distinguished from ordinary circumstances. It must be something exceptional in character, something that exceeds or excels in some way that which is usual or common." Ngeh and some Pakatan leaders have argued that the "special circumstances" of this case involved undoing the injustice caused to the new villagers when they were uprooted and relocated to new villages during the Emergency with a 30-year lease. When the lease expired, it was extended again for another 30 years by the previous government. The Pakatan leaders explained that because the land would revert to the state after the expiration of the leasehold period, this uncertainty should be removed. In addition, Article 8 of the Federal Constitution has not been infringed because there is no discrimination on the ground of religion, race, descent, place of birth or gender. While there may be some merit in this argument, it is difficult to ascertain the "special circumstances" which render the Penang government to convert leasehold titles of residential properties to freehold in the land-strapped state. In any event, the legality of this move now appears to be challenged by the decision of the National Land Council that its approval must first be sought. In this respect, the Penang chief minister's statement that the council could only "advise and consult" the state government is not entirely correct. It is clear from Article 91(5) of the Federal Constitution that Federal and state governments shall follow any national policy formulated by the council for the promotion and control of the utilisation of land and administration of any laws related thereto. Further, it can be inferred from section 9 of the code that any policy formulated by the council is to be followed by state governments. However, it is silent in Article 91 as regards the consequences of not following the formulated policy. At first, it may appear that the Federal Government can do nothing much about it but, legally, there may be two options available. Firstly, the Federal Government can take the two state governments to court. As the Government Proceedings Act 1956 prohibits any injunction to be obtained against a government, the Federal Government can only obtain a declaratory order to the effect that this conversion exercise is unlawful as it goes against the formulated policy of the council under Article 91. But this may take years, and is, therefore, not the most effective way to secure compliance. Hence, the Federal Government can invoke a little clause in Article 71 of the Federal Constitution to secure compliance with Article 91. Article 71(3) provides that: "If it appears to Parliament that in any state any provision of this Constitution or of the constitution of that state is being habitually disregarded, Parliament may, notwithstanding anything in this Constitution, by law make provision for securing compliance with those provisions." This is indeed a very powerful provision and our founding fathers must have seen it coming by inserting this clause to ensure that the supreme law of the land is not disregarded. This clause has never been invoked before but if invoked, the Federal Government can make law or amend Article 91 to expressly provide that any act or decision which is inconsistent with the formulated policy of the council is null and void. There is also nothing to prevent the amendment from having retrospective effect. This is because Article 71(3) allows such power to legislate, notwithstanding anything contained in the Constitution. In other words, the amendment to Article 91 can also be passed by way of a simple majority as the requirement of meeting a two-thirds majority is dispensed with under Article 159(4)(b) of the Constitution. Of course, Article 71(3) can only be invoked if there is a "habitual disregard" of the Constitution, but surely converting leasehold titles in batches and in the thousands is a habitual disregard of Article 91 of the Constitution. That said, at the end of the day, political considerations may just outweigh legal ones, and everyone knows that this also has very much to do with politicking than anything else.